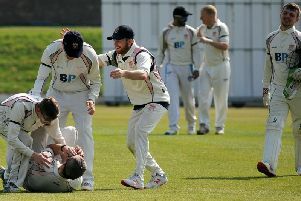 Fylde coast cricket preview: Key weekend in title race? Professional Jovaun van Wyngaardt would love to score that elusive half-century on his final appearance of the season for Blackpool in their most important match of 2018. The South African flies home to Tuesday for the start of the season in his homeland, a day after Blackpool’s match away to current leaders Netherfield which may well decide the destiny of the Northern Premier League title. The 25-year-old all-rounder would love to return to Stanley Park, but if Monday’s match in Cumbria does turn out to be van Wyngaardt’s final match for Blackpool, he wants to make it the one he will be remembered for. He has thoroughly enjoyed his first season in England despite a top score of 46 with the bat. The fast-medium right-hander has fared better with the ball, taking three five-fors en route to 37 league wickets. Blackpool do have a home game against Preston tomorrow before they head north, but considering the rock-bottom West Cliff side have amassed just four points all season, van Wyngaardt and his team-mates can be forgiven for focusing on champions Netherfield, who stand nine points above them with four games to play. He told The Gazette: “It will come down to the team who wins on Monday winning the league. I can’t see it any other way. “I’d have liked a few more runs, but sometimes you rock up and it goes your way and sometimes it doesn’t, even though conditions have helped batsmen with the good weather this season. Van Wyngaardt’s bowling almost made the difference at Leyland last weekend, but the hosts held on for the draw despite his 4-53 and Netherfield increased their advantage by five points. He recalled: “We all tried our best and did really well. “The ball was moving a bit more at the start but batting conditions were easier second innings. Among those batsmen to have caught his eye is Josh Boyne. Van Wyngaardt would love to watch Boyne and the other developing players continue their progress next year but he added: “I’ve had no talks with the club about coming back, though I would really like to.